Check in on efforts to reach parity internationally and move forward. The next generation of activists demonstrates the power to change the world. Meet a 16-year-old force in music tech and learn ways to boost internships. Revisit the profiles of women running for office to make a difference. Step up, applaud and endorse the suggestions and actions of other women in meetings, conferences and on social media. Ashley Judd, Salma Hayek and Annabella Sciorra promised "Time's Up" at the Oscars ceremony for a future of "limitless equality, diversity, inclusion and intersectionality." Your career may be more of a collection than a trajectory. This is our moment to act, says Northwestern University Leadership prof.
Research shows you can learn more by listening. Join us for a provocative conversation this Women’s History Month, with women making history now! What barriers have they had to break through, what new direction are the #MeToo and #TimesUp movements taking women, and what are they doing to make history today—along with you? Join Rachel Feldman, director of movies, tv, digital shorts and screenwriter of the film, Fair Fight, the story of Lily Ledbetter; and Teresa Younger, CEO and President of the Ms. Foundation, for a conversation about women, history, and the powerTO make change happen in our lifetimes. 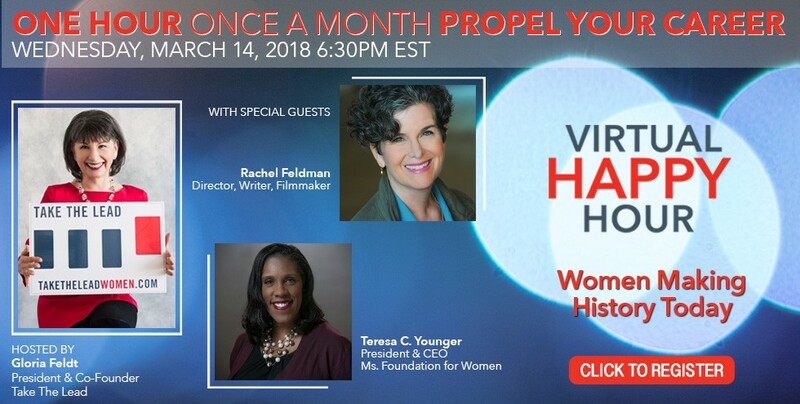 Tune in live to ask questions and share the some of the ways you are using the momentum of women's speaking out and up to make history in your life. How can you make history? You'll automatically be entered into our monthly giveaway when you register. This month, you'll get our free e-book with Take The Lead's Top Tips For Getting to Pay Parity. Lyft is driving all of us to gender parity with donations to Take The Lead. When new users sign up with Lyft and current Lyft users type the code TAKETHELEAD17, Lyft donates $10 to Take The Lead.